Vivian Maier was a Chicago based street photographer who was only recently discovered after her death in 2009. 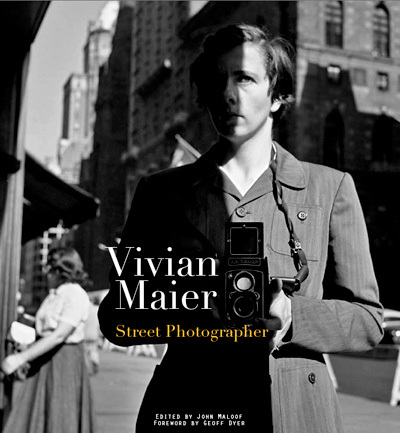 I have been reading the book “Vivian Maier – Street Photographer” which features some of her best work. Maier’s work includes some travel photography, self portraits, and street photography. You can read more about her here. I was drawn to the image featured in a slower, less intense way than usual. I didn’t really notice it much to start with, but it gradually became one of my favourites from the book. The framing of the fence works for me, and provides a separate plane of vision at the front which contrasts to the couple at the “rear” of the image. The older couple appear to have just gotten married, seemingly finding each other later in life. Once you see the couple, then the viewer’s eye moves to the casual disregard of the man reading the paper, and his casual disregard of the couple. The contrast of the hopeful, if slightly desperate looking couple to the guy who cannot even be bothered looking up from his newspaper to the couple is a strong theme. Forgive me a quote from the wonderful movie “Streetfighter” starring Raul Julia. Chun Li: … hmph. Slave labor. My father was the village magistrate. A simple man with a simple code: justice. He gathered the few people that he could to stand against you. Chun Li: You and your bullies were driven back by farmers with pitchforks! My father saved his village at the cost of his own life. You had him shot as you ran away! A hero… at a thousand paces. Bison: I’m sorry. I don’t remember any of it. Chun Li: You don’t remember? Bison: For you, the day Bison graced your village was the most important day of your life. But for me, it was Tuesday. It sums up the contrast nicely. What have I learnt from Maier’s image? 1. Find contrast between very different levels of intensity shown by subjects. 2. Accentuate the contrast by placing each subject on a different plane in the image. 3. Find subjects who are hopeful and happy. More to come once I have spent some more time reviewing Maier’s work. Sure have – Melbourne Silver Mine have organised an outing to the movie. you should check it out! Hang on – which movie? Streetfighter? I think Bison really has a lot to say on technique as well. I am glad someone else shares my appreciation of Bison’s relevance to contemporary street photography!